GoPros and other such action cameras have been becoming ever more popular with a wide range of people. Swimmers, bikers, surfers, snowboarders, and every other sportsman in between seems to love the GoPro, which is for good reason. GoPros and other such cameras are fantastic ways to capture high paced action without having to hold a camera in your hands. These GoPros are fantastic for capturing all kinds of action when you are on the go. Even better is that they can be mounted to your body, to helmets, handlebars, surfboards and more. Well, today we aren’t here to look at GoPros, but at Gimbals for GoPros and other such action cameras. In case you are not familiar, a gimbal is a device used to hold cameras and other electronic devices, the purpose of which is to hold them steady in a horizontal position, to mount your camera to a specific surface, and to make capturing video and pictures much easier. A gimbal stabilizer is a quick way to ensure that every single image that your GoPro captures will be a lot steadier and a lot less distorted. In this Best Waterproof GoPro Gimbals Review, we are going to show you which products would be best for capturing perfect action shots during water sports, or in any environment where your GoPro could potentially get a little bit wet! In other words, these gimbals allow you to mount something like a GoPro camera to virtually anywhere, while ensuring that it is horizontal and at the best angle for capturing images, while also usually allowing you set it up on a tripod and even to control your camera from a distance. More or less, to put it in fancy terms, a gimbal is an electronic gyroscopic stabilization device, and in this case we are talking about them in specific reference to your GoPro cameras. If you thought that GoPros were awesome, just wait until you know a little more about these gimbals. The REMOVU S1 3-Axis Rainproof Gimbal is a fantastic option for people that own GoPro cameras. It is compatible with the HERO5 Black, the HERO5 Session, the HERO Session, the HERO4, the HERO3+, and the HERO3. It is worth noting that the latter three devices can only be used in dry areas without their own individual waterproof housing, with it they can be used in rainproof settings. This particular gimbal works on a 3-axis system, running 3 different high-quality motors at once. The motors themselves are known to be brushless DC motors that feature rotary sensors, delivering stable shots that look professional. This professional feel is pushed even further by the settings of the gimbal, as it can be used in either PAN, FOLLOW, or LOCK mode. The REMOVU S1 3-Axis Rainproof Gimbal itself has been designed specifically to be water resistant, with that resistance taking place in both the S1 body and the motors themselves. As mentioned, earlier GoPro devices do require their own unique housing systems to enable them to utilize the waterproof nature of the gimbal. When it comes to gimbals for your GoPro, the REMOVU S1 3-Axis RainProof Gimbal has to be one of the very best models around. It comes with a whole lot of features that makes it a top contender without a shadow of a doubt. This particular model of Gimbal is specially intended to be used with your GoPro Hero 6, 5, 4, 3+, and 3. If you thought that your GoPro was really neat, just wait until you see what your action shots look like when they are totally stable thanks to the gyroscopic nature of the REMOVU S1 3-Axis RainProof Gimbal. This model of Gimbal comes with a whole lot of features and options which serves to make it one of the most durable, effective, convenient, and user friendly options that you can find on the market today. So, let’s take a few minutes to talk about the various features of the REMOVU S1 3-Axis RainProof Gimbal. REMOVU S1 3-Axis Gimbal with Wireless Remote control. What's Included in Box. You could use it in a handheld environment, holding the handle and walking around with the gimbal. Or, you could detach the handle from the body and mount the gimbal onto any GoPro compatible mounting system. This gives you the opportunity to film in a variety of different ways. You could even wear the camera on a helmet, or on a harness on your chest, giving you the opportunity to film from a real point of view angle. A wireless remote control also comes with this product, in the form of a detachable wireless joystick remote control. It can be used to control the angle of the camera itself or to switch between the three different settings. One downside is that you cannot do the firmware updates required with a MAC device, they have to be done with a PC. Without a doubt, one of the best features of the REMOVU S1 3-Axis RainProof Gimbal is that it has a whole lot of options in terms of carrying and mounting it. First off, it does come with a convenient handheld handle, so you can simply carry it along with your GoPro mounted to it, if you so choose. However, the really neat part about the REMOVU S1 3-Axis RainProof Gimbal is that you can remove the handle in order to make it compatible with virtually every single GoPro mounting device out there. You can mount this gimbal to a tripod, to a helmet, to a chest strap, to handlebars on your bike, to hang glider bars, your snowboard or surfboard, and even to floating GoPro mounts that swim freely in the water. In other words, this Gimbal can go anywhere that your GoPro can go and can be mounted to any GoPro compatible mounting device. Speaking of water, the REMOVU S1 3-Axis RainProof Gimbal is totally waterproof, so having it with you in the rain, while swimming, or even submerged in water is totally doable. You can mount this bad boy on a floating GoPro rig to film you while snorkeling, all the while defying the waves and staying as steady as can be. 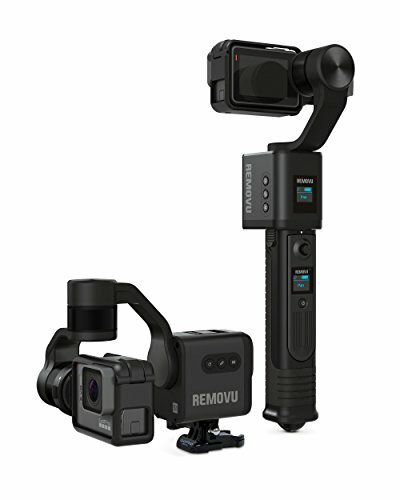 Of course, the REMOVU S1 3-Axis RainProof Gimbal uses some really advanced and state of the art technology to provide you and your GoPro with total stability for all of those important shots. This model uses a 3-axis stabilization gyroscope so it always stays stable, in place, and allows your GoPro to capture some of the clearest and crispest shots possible. It is made with a world class brushless motor for ultimate longevity and rotary sensors to keep it constantly readjusting the angle of the GoPro to suit your needs. What is also pretty neat about this model is that it allows for great slow motion and time lapse photography. 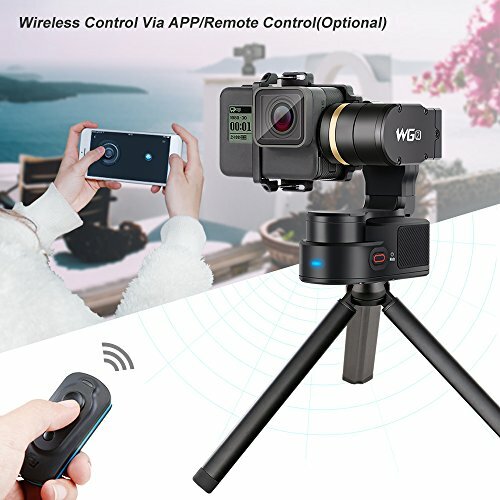 Something else that you might like about the REMOVU S1 3-Axis RainProof Gimbal is that it comes with a wireless remote control and detachable joystick. That’s right, you can set this gimbal up fairly far away from you on a tripod or other mounting device, all the while using the wireless remote and joystick to adjust the angle and change the gimbal filming mode. Having a stabilizing gimbal that can attach to virtually anything is awesome, but having one with a remote control that can be operate from far away is simply outstanding. On a side note, the REMOVU S1 3-Axis RainProof Gimbal uses rechargeable batteries and even comes with an easy to use charging dock. 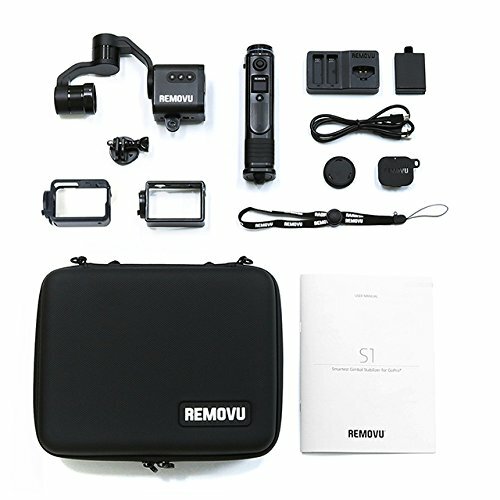 The REMOVU S1 3-Axis Rainproof Gimbal is a good choice if you are looking for a gopro gimbal that be used as a handheld gopro gimbal and also as a wearable gopro gimbal. It has smooth operation with a slight noise from the motors. The Waterproof Wearable Gimbal WG2 by Feiyu Tech has been designed specifically with active people and the variety of activities that they might participate in mind. It has to be worn, leaving your hands free to do anything that you want them to do. When it comes to the compact nature of cameras, a GoPro is about as compact as you can easily get. This gimbal has been developed with that same strategy in mind. It is both compact and lightweight, enabling you to carry it in a variety of different places, including your backpack or your coat pocket. The Waterproof Wearable Gimbal WG2 by Feiyu Tech comes with a certification rating of IP67. IP stands for the international protection marking, a standard that has been drawn up by the IEC. The first digit, 6, stands for the amount of resistance that the product has to dust, as well as other particles like dirt and sand. The second digit, 7, provides the actual overall certification for water resistance. What this means is that this particular gimbal is completely safe to use in depths of up to 1.5m, although the official standard agency recommends that you do so for no longer than 30 minutes at a time. The Waterproof Wearable Gimbal WG2 by Feiyu Tech also features precise mechanical rotation, enabling you to achieve perfect shots during underwater work. The movement of the rolling arm automatically finds a perfect balance for the camera that the gimbal is supporting. The sliding arm on this device actually enables it to be used with a wide variety of different cameras. These range from the GoPro 5 and 4 devices to any cameras that feature a similar size and weight to those ones. The gimbal itself can be used in a variety of different ways. It is fully compatible for use with any GoPro compatible mounts, or you could use a selfie stick to get a first-person view. You could also mount it onto either a helmet or chest support. In our opinion, this particular device would be perfect for water sports and the necessary mounts that are involved. 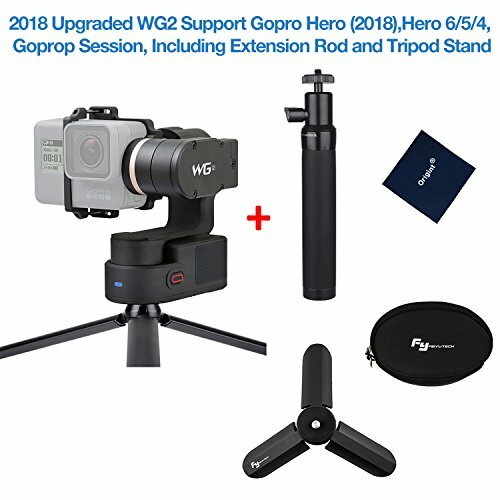 The Waterproof Wearable Gimbal WG2 by Feiyu Tech also has the ability to support time-lapse photography, due to the 360-degree panning and pitching that it can offer to the user. It should be noted that FULL mode makes the camera align to wherever you point it, while FOLLOW mode locks in the pan axis to stabilize every shot up and down, resulting in the camera always pointing in a single stationary direction. Yet another great electronics brand name to consider, Feiyu Tech also makes some really awesome state of the art devices, such as this wearable gimbal. It does differ a little bit from the first model of gimbal we looked at, but being different does not mean that it is better or worse. In fact, many people have noted that the Feiyu Tech Waterproof Wearable Gimbal is one of the best around. This particular model is ideal for many different models of GoPro, plus many others which are of a similar size to the GoPro. This bad boy is extremely durable, it’s highly functional, and it comes with a few really neat accessories too. Let’s take a couple of minutes to do an in depth Feiyu Tech Waterproof Wearable Gimbal review. One of the things that you might really like about the Feiyu Tech Waterproof Wearable Gimbal is that it works with lots of different GoPro style cameras. It is of course compatible with models such as the GoPro Hero 5, 4, and session, as well as with many other cameras of a similar size. Moreover, it has special mounting marks for the GoPro Hero 4 and 5, in order to provide you with quick and secure mounting. On that same note, the Feiyu Tech Waterproof Wearable Gimbal comes with an ultra-secure mounting mechanism which is combined with extra-long screws. This is in order to make sure that your camera does not come undone from the mount no matter what you are doing. Next, another really neat aspect of the Feiyu Tech Waterproof Wearable Gimbal is that it is totally wearable and mountable too. It supports all kinds of ¼ holes for fast, reliable, and precise mounting to a variety of mounts. You can mount the Feiyu Tech Waterproof Wearable Gimbal to a chest strap for kayaking, to a helmet for biking, to a car door for driving, and much more. Even better is that the Feiyu Tech Waterproof Wearable Gimbal is totally waterproof in every way. You can literally submerge this thing without any risk of water damage and breaking. That’s how tough it is. For this reason, the Feiyu Tech Waterproof Wearable Gimbal is one of the top choices for surfers, snorkelers, and scuba divers too. You can mount it to a floating platform or even a submerged mount in order to film you while you are under the surface of the water. It also uses special technology to help balance and stabilize your camera even in wavy waters and strong currents. On that same note, just like other modern gimbals, the Feiyu Tech Waterproof Wearable Gimbal uses some really sophisticated tech to balance and stabilize itself no matter what you are doing. The rolling 3-axis arm uses special sensors to constantly stabilize itself and adjust its position for the best possible shooting of videos and pictures. Something else that you might like about the Feiyu Tech Waterproof Wearable Gimbal is that it features the ability to engage in 360 degree pitching and panning for some really wonderful shots. To make your shots as clear, stable, and precise as possible, this model also features a high frequency jitter interference mechanism as well as a high speed motion sensor interference mechanism. In other words doing something like mounting biking, which is really high speed and involves a lot of bumps and jitters, will not be an issue for the Feiyu Tech Waterproof Wearable Gimbal. 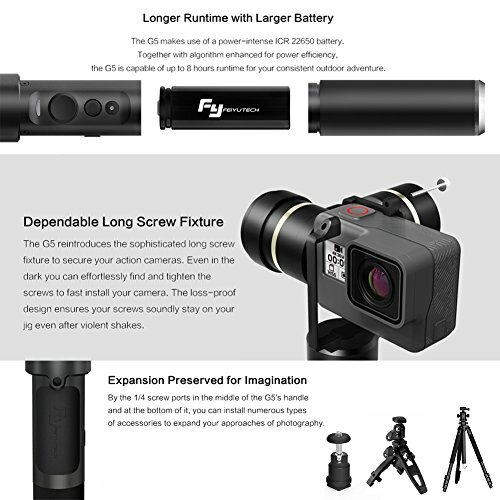 To make life easier for you, the Feiyu Tech Waterproof Wearable Gimbal can connect to your smartphone with a special app in order to allow for long distance remote controlling. You don’t even have to touch the Feiyu Tech Waterproof Wearable Gimbal to use it. Also, the Feiyu Tech Waterproof Wearable Gimbal comes with a nice little tripod too! This gimbal can even support time lapse photography, which is definitely quite impressive by all means. The Waterproof Wearable Gimbal WG2 by Feiyu Tech is a much need upgrade to the original Feiyu Tech WG 3-axis wearable Gimbal. It is smaller, waterproof and resistant to sand. It's perfect for mounting on a helmet as it is only weighs 0.6 lb without the camera. When you have a specific camera, it can be hard to tell exactly which gimbal you should choose. Most gimbals cover a range of different devices, some of which will work better than others. 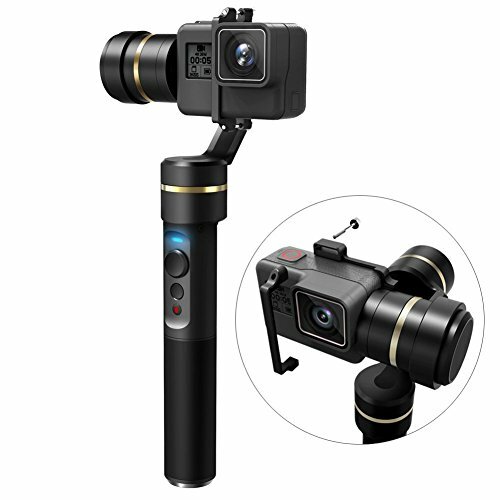 The Feiyu Tech G5 3-Axis Handheld GoPro Gimbal is a little bit different, as it has been specifically tailored with a precise counterweight for the GoPro HERO5 Black. While it has been specifically tailored to that camera, you could also use a few other cameras with it. It is compatible with the HERO5, AEE, ​YI 4K Action Camera, and any action camera that features a similar size to that of the GoPro HERO5 Black. Just like the Waterproof Wearable Gimbal WG2, the Feiyu Tech G5 3-Axis Handheld GoPro Gimbal features a certification level of IP67. This means that you could use it underwater in depths of up to 1.5m for a maximum of 30 minutes. This enables you to film without worrying about water, at the seaside, or just in terrible weather. A lot of users use this particular gimbal for filming while surfing, as it has all of the necessary safety features. The Feiyu Tech G5 3-Axis Handheld GoPro Gimbal also features a set of anti-loss long screws. These screws are used to offer the camera an extra layer of stability, completely getting rid of any violent movements that the camera might be exposed to. Otherwise, these movements would result in heavily distorted footage. There are three modes that you can use with this particular gimbal. PANNING mode enables the camera to follow left and right when the handle is turned to either side, PANNING AND TILTING mode enables the camera to do the same as PANNING mode, but it can also move up and down. This mode really does offer the most freedom, as the gimbal will smoothly follow any direction that you turn. The final option is LOCK mode, where the camera stays fixed in just one direction regardless of how much you move your hand around. An intuitive interface has been built into this particular gimbal, as you can switch between modes or turn the camera off and on with just a single button. Camera angles themselves can be adjusted using a single 4-way joystick on the gimbal, and it is a perfect match for the voice control system that can be found on the GoPro HERO5 Black. This third and final option on our list of best gimbal reviews is yet another really neat option to go with. The Feiyu Tech G5 3-Axis Handheld GoPro Gimbal, as the name implies, is more or less only a handheld model, but it does have the ability to work with a few mounting options if you so choose. This particular model of gimbal may not be quite as fancy or come with as many accessories as some of the other ones we have looked at, but it is still a good option none the less. It’s a great investment to make thanks to the fact that it is fairly durable, has a great battery, great stabilization tech, and a few other key features too. If you are all about capturing high paced action on the go and getting those pristine shots, the FeiyuTech G5 3-Axis Stabilized Handheld Gimbal might just be the right option for you. Let’s take a few minutes to talk about it a little more in depth. One of the really neat parts about the Feiyu Tech G5 3-Axis Handheld GoPro Gimbal is that it is compatible with a very wide range of GoPro and GoPro style cameras. It is compatible with more cameras than any of the other options that we have discussed so far. 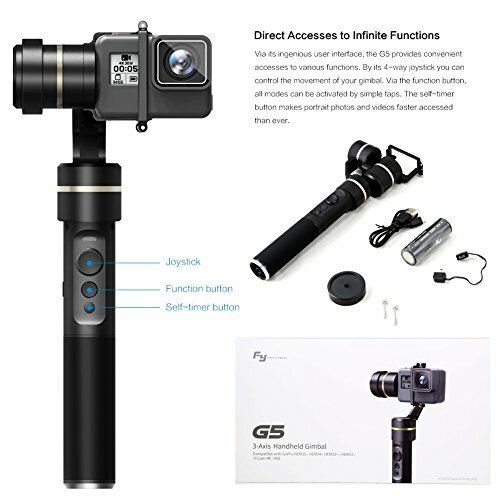 The FeiyuTech G5 3-Axis Stabilized Handheld Gimbal is compatible with the GoPro Hero 5, 4, 3+, and 3, as well as with the Yi Cam 4K, AEE Sports Cams, and various other action cameras of similar sizes. As you can see, this model is very versatile in terms of its mounting capabilities. What is also neat is that the FeiyuTech G5 3-Axis Stabilized Handheld Gimbal uses a precise counterweight to keep you, the gimbal, and your GoPro evenly balanced for the duration of the shooting time. Moreover, the FeiyuTech G5 3-Axis Stabilized Handheld Gimbal is very safe in terms of its mounting. It uses long anti-loss screws to securely mount any camera of your choice to the FeiyuTech G5 3-Axis Stabilized Handheld Gimbal. This mounting system makes it very easy to attach and detach your camera and it keeps it safe in fast paced environments. Your GoPro will definitely not fall off this gimbal, which is a big bonus for people who use it for action sports. Another thing that we love about the Feiyu Tech G5 3-Axis Handheld GoPro Gimball is that it has a very solid build. It is both extremely comfortable and easy to use as well as very durable too. This gimbal is made with solid aluminum alloy, which is one of the most durable materials that could be used for this kind of thing. At the same time, the aluminum alloy build is also very lightweight so you don’t get fatigued while holding the FeiyuTech G5 3-Axis Stabilized Handheld Gimbal. The ergonomically designed rubber grip on this model makes it comfortable to hold for hours on end. Something that really stands out about the FeiyuTech G5 3-Axis Stabilized Handheld Gimbal is the impressive battery life it comes with, something which cannot be said for the other models we’ve look at today. This model comes with a 22650 lithium-ion battery, which allows for a total runtime of 8 hours before needing to be charged. That is a very impressive runtime and is in fact better than most other gimbals on the market today. In terms of stability, the Feiyu Tech G5 3-Axis Handheld GoPro Gimbal features a unibody motor arm to combat shaky and jittery terrains. No matter how many rocks your bike over or how big the waves are, the FeiyuTech G5 3-Axis Stabilized Handheld Gimbal will ensure that your shots aren’t shaky and that they are steady as can be. Just like the other gimbals we have checked out today, this one also uses some really great gyroscopic-like technology to achieve steady shots at all times. When it comes to water, the FeiyuTech G5 3-Axis Stabilized Handheld Gimbal is totally waterproof, so you can use it while swimming, surfing, or just out in the rain too. Finally, the fact that the Feiyu Tech G5 3-Axis Handheld GoPro Gimbal comes with an easy to use interface, a selfie button, and a 4 way joystick to rotate the camera is pretty cool too. Besides the fact that this model doesn’t have great mounting capabilities, everything about it is top notch. The Feiyu Tech G5 3-Axis Handheld GoPro Gimbal is an amazing piece of technology. Right out of the box anyone can start using it without a challenge. There is no noise at all from the powerful motors. I really like how it looks and feels. It has the highest available battery life of 8 hours which is more than I've ever needed. Overall I would choose this gopro gimbal unless I needed the wearable feature. This one is also unique in that it has been designed specifically with a single GoPro in mind, yet it still works perfectly with a range of other devices. Everything from the intuitive interface to the gimbal settings work well together, enabling you to capture footage that is perfectly smooth, rather than the standard jittery footage that would usually be produced by a GoPro. Remember to look at a variety of different factors when you come to choose your own gimbal. It needs to be suitable for you and your needs, but it also needs to work perfectly without any risk of it breaking while in use. The construction and design of the gimbal is probably the most important factor to consider, as that will determine the shots that you can capture with it. If you are creating videos with your smartphone you want to read this review of the EVO Shift gimbal. A gimbal is a type of device that is commonly used for capturing steady video footage. Gimbals themselves usually work on a 3-axis system that includes several motors being readily used, keeping the camera steady and level regardless of the terrain that it may be exposed to. Gimbals are slightly more expensive than the standard stabilizers that can be found on the market, but they give you a lot more control as a user. You can control how you want your camera to be angled, and exactly how you want your overall video footage to look. Most gimbals have several different settings, ranging from the camera staying locked in one position to the camera being able to pan around as you move. Most of these gimbals are also rechargeable, featuring built-in battery packs that help you increase the amount of time that they work for. For long video sessions, you could simply take several batteries with you, ensuring that your sessions are not cut much shorter than you intended them to be. There are a lot of different gimbal devices available on the market, for a range of different cameras. Knowing which ones are good and which ones are bad can be relatively difficult, as some gimbals give you perfectly clear footage while other gimbals produce footage that still looks relatively shaky and distorted. One of the most important things that you need to consider when looking at a gimbal is whether or not it is actually compatible with you and your requirements, so ensuring that it is suitable for your needs is an absolute necessity. Why should you use a gimbal? Anyone that has ever used a GoPro without a stabilizer will know exactly why a gimbal is a necessity, as the footage that is produced by most GoPro devices is always a little bit distorted. These perfect cameras pick up on every little shake, and the evidence of that can be found in your video footage afterward. A gimbal has the ability to offer you a wide range of motion, with motion settings of your own choice, without you even having to spare a thought for stability issues. They also allow you to easily move your camera around without a single problem occurring. You can save a lot of time and energy by simply moving your camera around freely, producing images that are not distorted without having to concentrate on cutting the footage where you move your camera. How much does your camera weigh? The overall weight of your camera with all its attachments, and sometimes the brand, is something that has to be taken into consideration when you go to choose a gimbal. Different types of gimbals have different weight capacities, so you need to ensure that the one that you purchase is suitable for use with your own camera. Most of the time, gimbals are only compatible with cameras that are relatively lightweight. So, a GoPro is the perfect option. You also have to consider the compact nature of a lightweight camera, as they are easy to carry around on your adventures. The construction and design of the gimbal that you are looking at is something that has to be taken into consideration. You should thoroughly research the way that the individual gimbal works, and see whether or not it is actually suitable for your requirements. For example, do you want a gimbal with a long handle or a short handle? There is no right or wrong answer, as the answer actually comes down to a mixture of personal preference and which you find more comfortable. This could require a little bit of trial and error testing, so it might be advisable to find a gimbal that features numerous attachments if you aren’t too sure. You also have to consider whether or not the gimbal can be spun around while filming. This can make a massive difference, as it makes filming on the go an awful lot easier than it otherwise would be. Other factors to consider are the material that the grip is made out of, and whether or not the design of the gimbal will offer your camera enough stability. The grip should be comfortable to hold, otherwise, you might not want to hold it for long time periods. If you own a camera that is relatively heavy, then it will require a longer stabilizer. Most people never take into consideration how easy a product will be to assemble until they actually own it, but it is important to take it into consideration beforehand when it comes to gimbal devices. You have to remember that most of your filming will be done while moving around and participating in different activities, so struggling to assemble your gimbal would be disastrous. You should aim to purchase a gimbal that you know can be assembled rather quickly, especially if you plan on using it frequently. You need this speed so that you can concentrate on the important footage that you are filming, and not wasting time trying everything to put your gimbal together. Any excessive amount of time will eat into the time that you have to film, so putting your gimbal together should be an easy task that takes no more than a few minutes. Another thing to consider is whether or not you need specialist tools to assemble the gimbal that you have found. If you do, then you should consider purchasing a spare set. This means that you don’t have to worry if you do lose an item, as you will already have one readily available to use.